He glanced to the worried face of Antin, his Hunting Eagle. It meant something that the Indian had remained by his side to brood. “Elizabeth planned well,” He said. Antin was close to the earth in ways Blaine couldn’t understand. His eon’s long lineage of taking care of mother’s dear skin had granted him a skill or two. “She does like to rant on about faith and inevitability.” He’d almost not taken her offer. He first thought she was crazy or wild desperate to seek him out, especially since she knew what he was. “She sacrificed much,” he continued. She had smiled when she’d said she’d never seen a Gigante born sailor before. He’d never found out how she knew. He remembered the incredulity that had stretched across his face when he’d found out. His father had told him stories, had tried to prove it, but who could believe such a thing. Demon spawn? Him? OK Dad. Thanks for that. Just the thing to find out at thirteen years old. He’d left their rural Oklahoma farm soon after, had told dad he was heading for the ocean. Dad had made a wild eyed face, had uttered ‘Crazy’ then had turned his back. He’d never looked back, not once, but Blaine had, more than a few times. “You alright Boss?” He glanced to Antin. The man was too perceptive. He probably should have left him home for this one. But old habits die hard. Antin had his uses. “What of the fool, Marvin?” Wilhelm asked, still marveling at the staff. He could feel the vast, old power. It seemed to speak to him. A look, all in the eyes, for Agolloch’s face suddenly lost life, flashed in confusion then he had Wilhelm by the throat. Wilhelm didn’t answer, but Agolloch got his answer anyway. He flung Wilhelm away. 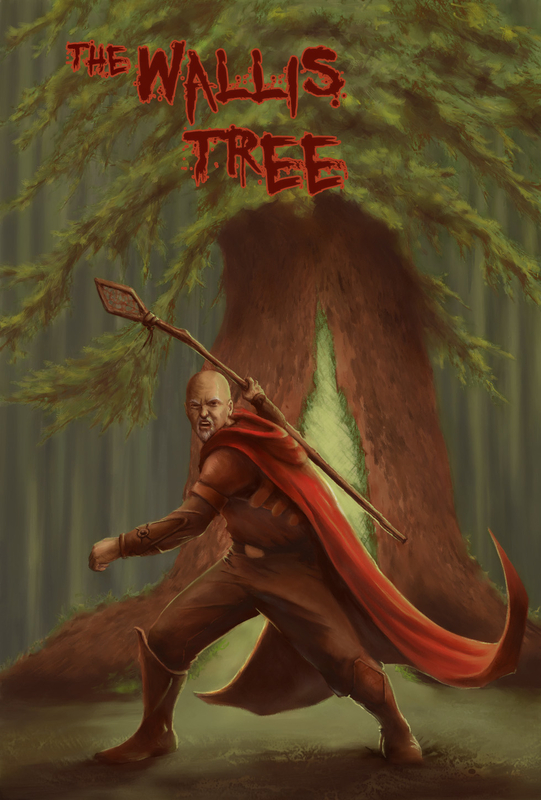 Wilhelm clung desperately to his staff and controlled his speed, slowly coming to a stop just shy of one of the great trees. “Marvin was to meet you tonight. He and his chosen,” Wilhelm interjected. Elizabeth feigned sleep until Marvin was asleep. Her beloved always slept like a log. He’d said on their honeymoon to Switzerland that the rocking of the boat was like a stiff wind on a cloudy day. She doubted he would awaken till morn. She rolled to her feet and made sure her cheeks were dry. She wouldn’t show tears to Blaine Gentry. He was incapable of understanding such a thing. The door creaked as it opened, but so did the whole ship as it rode the waves in the black of night. She could feel Marvin’s study presence still on their tiny bed, so she padded up the stairs. Blaine had not had to kill the driver. It had made things all too real. John Kelly’s wife would be beyond devastated when she found out. Her children would be without a father. She stepped out on the dark deck and strode toward the back of the boat where she knew Blaine to be. His hot metallic odor stained the salty wind. His snake writhing presence filled the metallic boat. “Will that tree sap smell ever go away?” Blaine asked. She got closer, keeping a hand on the rail as she neared. She could sense Blaine’s man close by. Antin. He smelled like the dessert at night. “When I wish.” But, she wasn’t sure. She rubbed her belly. The baby was so heavy. “You didn’t have to kill him.” The words were out before she could stop them. She could see him in the blackness, without color, thank Rhea for her training. He shrugged muscular shoulders and lit a cigarette. He maintained course using an elbow on the wheel. “You made me wait,” he said. “John Kelly was not a threat.” Tears once again threatened. She’d been too wrapped up in the moment to pay attention. All this water was confusing. Talking to the Gigante had rattled her. Not being constantly on guard for Agolloch had given her a false sense of safety. She turned around. There stood Marvin, off to the side. He kept muttering under his breath and looking right at her. Like a tree, Wilhelm’s staff loved the dirt. Every step he’d rest the end on the soft loam of the forest and every other step he’d pick it up and move it forward. And, with every step he found the staff becoming more difficult to uproot and progress. It was as if the tree knew and didn’t want to leave its home. He’d have to teach it the joys of mobility. He too had been too stiff of late. He headed downhill toward the Loch River and Kildon acreage occasionally twirling the staff like a master swings a quarterstaff at a county fair. In the older day it was the Lordship jousts where men demonstrated arms. He’d learned long ago how to handle a length of wood. With his newfound senses he ranged ahead and all around. He felt everything. The heartbeats of animals soared in his ears. The shriek of bats and the silent wings of owls were as claps against his person. If this were not everything that could be then it was close. The river flowing down the highlands had its source from three separate lochs: the Ruan, Ani, and Achm. The ogre had told him the waters had deep connection to the sea underground through channels created by ice some 60,000 years ago. The water always smelt brackish and with his new senses it was more so. He trudged the steep decline down to the water’s edge and kept to the bank as he made his way to the old bridge. Once there he spied the old troll. It appeared as a whitish-gray rock in the middle of the waterway. “La meg.” The bridge vibrated with its noise. It sounded like two rocks grinding. “Agolloch sent me,” he said in the simpleton English used today. So much seemed lost with the current style. “Stop verden,” The ogre said. “It sent instruction.” The ogre unfolded from it bent position in the middle of the river. Wilhelm couldn’t tell how big it was. It was mostly submerged. The Ogre laughed. It sounded like wet moss squishing. “One of old Kronos’s line worried about time?” He slapped the water. Wilhelm smashed the end of his staff to the ground. The staff seemed to sigh with the contact then the bridge broke from its mooring and crumbled atop the still chortling ogre. It disappeared under the weight. He let a few seconds pass then bounced the staff up and down again. The bridge broke into bits. The ogre hadn’t moved an inch. The ogre dug into one of its mossy folds and came out with two rings which it tossed to the bank. Wilhelm crossed the river and collected the rings. He nodded and stepped into the river. “The half man carries his tree along. Original.” Wilhelm couldn’t make out enough of its features to be sure, but he thought the old ogre was smiling. ‘Take me to my grandson,’ he thought. The water lapped playfully and cold against his shin then even with his new senses he couldn’t properly describe what happened.